After form drawing, we moved into Language Arts. For the first graders, this would be their first introduction to the letters of the alphabet. 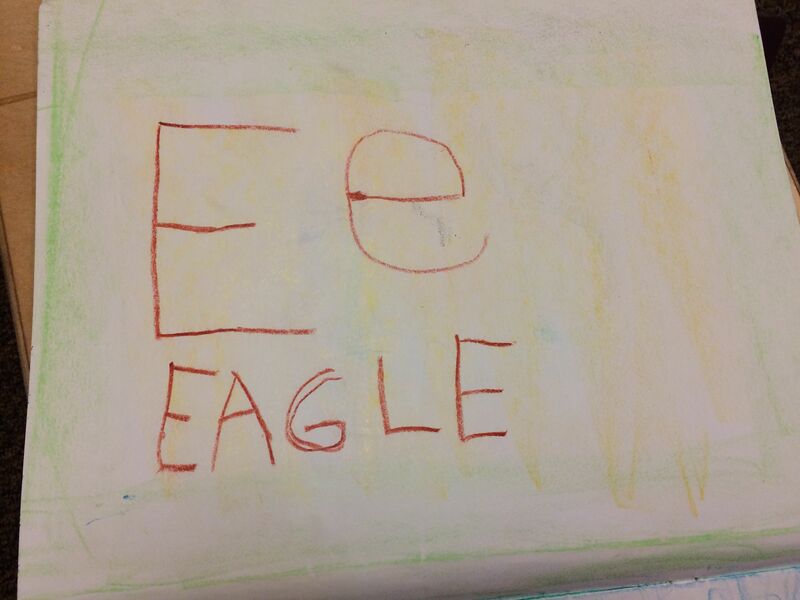 Waldorf classrooms introduce letters in a different way than I’ve seen in any other classroom. The letters are brought to the students first through story. For example, I told the Grimm’s story, Strong Hans. In the story, robbers live in a cave in which Strong Hans escapes. After telling the story, I showed them my drawing of a simplified cave. 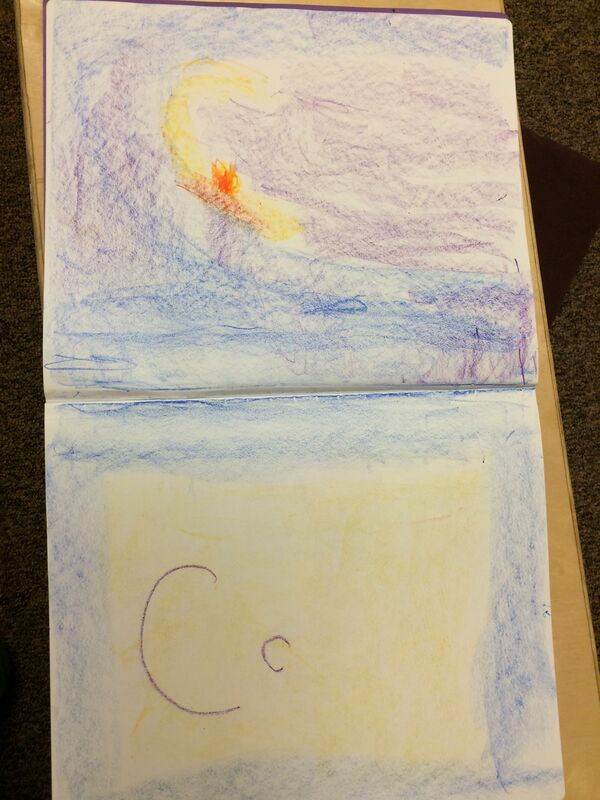 I pulled this image from the story specifically to introduce the letter C. My drawing of the cave highlighted the letter C as well, so the children could clearly see it. Then the children are immersed in the sounds of the letter C as I read a poem and then give them a tongue twister to try with “C” sounds. This process takes the abstraction out of learning letters and gives students a clear link between letters and their stories or pictures – which is just how human beings began to write; first in pictures and then in symbols. The next day, we recall the story together. With my prompting, the children retell the story. Here, I’m listening to how well they remember the plot and its details. I also listen for chronological order and comprehension. The fairy tales I tell are complex and rich in language. It is not easy to remember all of the details in the right order, and I can see on the children’s faces the work they are doing to pull the stories from within. 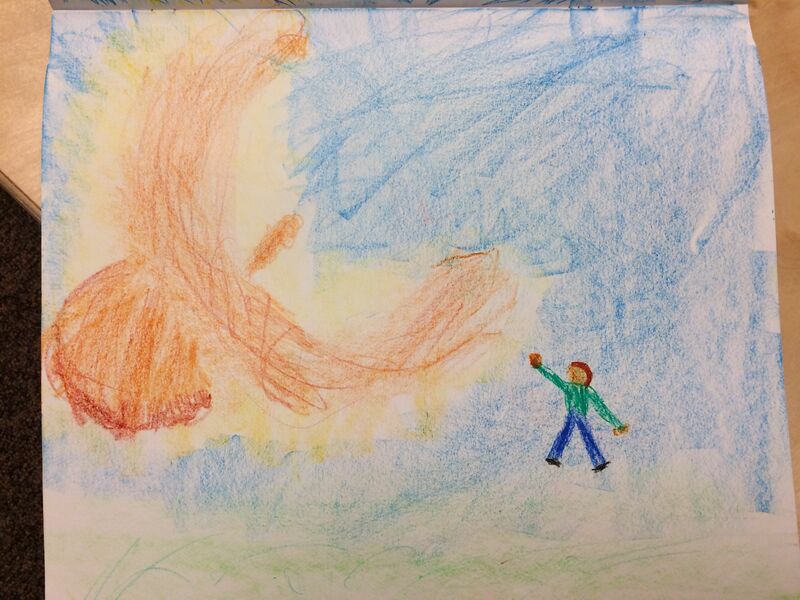 After we recall the story, we draw the picture together. Both first and second grade participate as I lead them through each stroke of the crayon. This is a drawing lesson where we learn how to use our block crayons to create our picture. We blend colors, hold our crayons the correct way, draw from the center out rather than outline and color in, and although we all draw the same image with the same colors we get a variety of beautiful pictures. Here are some examples. After we draw the picture, I teach the 1st grade how to write the letter and then I move onto more challenging work for the 2nd graders while the 1st graders listen. Often in this block I used the letter we learned in 1st grade as a beginning point to talk about consonant blends or word groups. Especially when I introduced a vowel to the 1st graders, I used the opportunity to work in word groups for the 2nd grade in both the long and short vowel sounds. Word groups help students who have not begun to read to find patterns in words and then easily sound them out. For readers, word groups are great spelling practice. Second grade also practiced writing beautiful sentences about the fairy tales we heard in this block. We always reviewed and read what we wrote the day before, and we always read what we write each day. 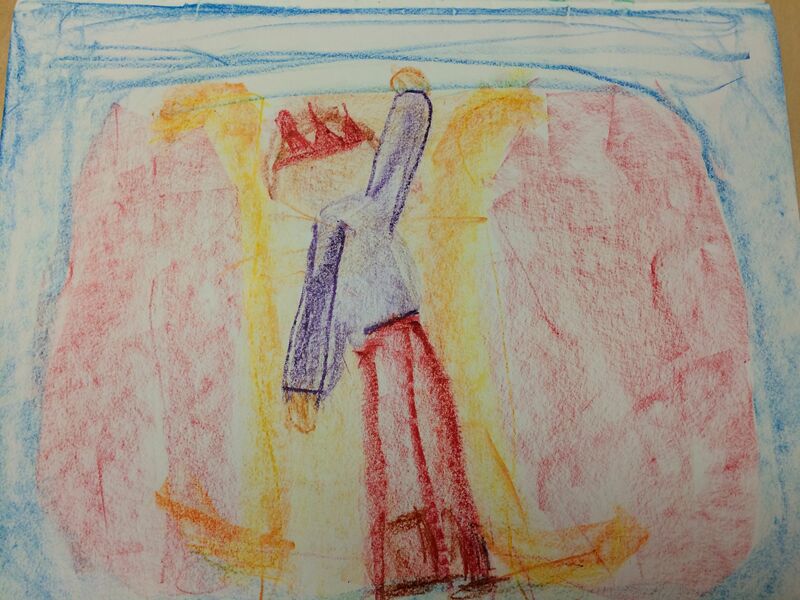 In Waldorf education, writing comes before reading and then we learn to read what we write. My second graders only came for 3 days a week in 1st grade, so in this block I was really covering all the phonics basics to make sure everyone had them. From our rhyming word groups such as sit, bit, mit, lit, fit, wit, hit, and bite kite, mite, right, sight, fright, and knight – we would then make silly sentences. The fit knight had a bit of a fright when he saw a mite riding on a kite. 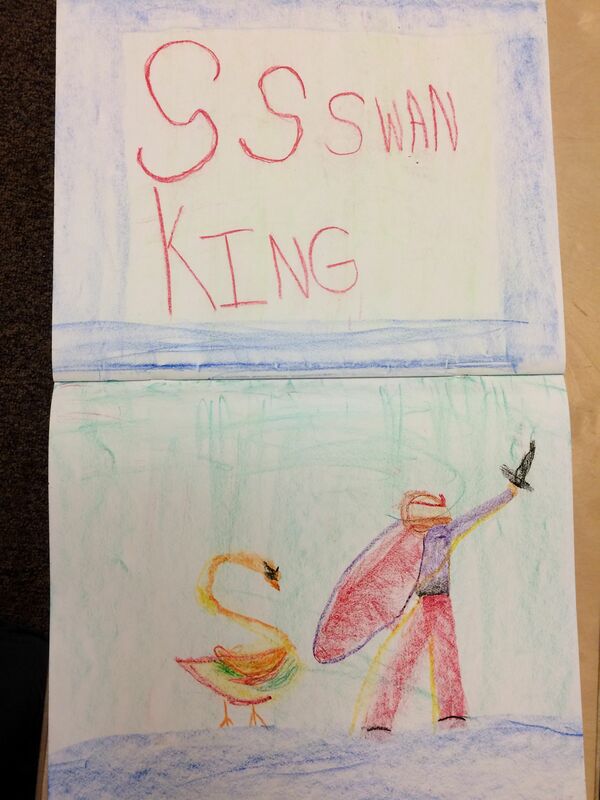 After this part of main lesson, the 1st graders write the letter and the word of the image they have drawn into their main lesson books and the 2nd graders write their word groups into their books as well. I walk around the room to help with crayon grips, flipping of letters, organization of books, and so on. Students must read what they have written to me before they put their work away. In the four weeks we had for this block, we almost filled one of our main lesson books. We did a lot of work! We heard fairy tales from Europe, Russia, China, and around the world. 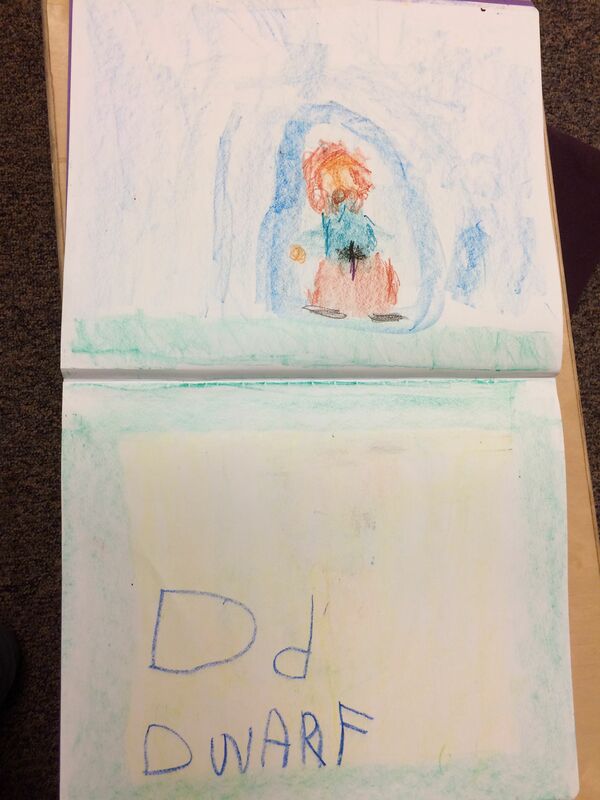 We learned our letters and how to write them and we learned the basics of reading and spelling. In our circle, we moved into singing songs about fall and the turning of the season. We prepared for our Michaelmas Festival and put on a play for our families. Acting out the story of St. Michael and the Dragon was great fun for everyone. Our class is coming together socially, learning to cooperate and speak kindly to one another and value everyone’s opinion. Play at Peace Park during recess is much easier now that the school year is well underway. Currently we are in a Math Main Lesson Block and there will be information coming soon about all we do for Math in our classroom!